The Ruegg Grant Committee of the Westport Woman’s Club invites local non-profit organizations to apply by Friday, March 8, 2019, for up to $10,000 in one-time funding for a 2019 project. Submitted proposals should be high-profile initiatives that make a meaningful difference in the Westport community. 2019 Ruegg Grant Application. 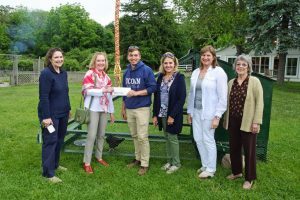 This grant, established in 1995 by an endowment left to the club by former member Lea Ruegg, considers an annual grant to a deserving organization’s project that enhances social services, health, safety, the arts or education. Recent Ruegg Grant beneficiaries include the Westport Astronomical Society, Project Return, Earthplace and Wakeman Town Farm. Other forms of the Westport Woman’s Club “here and near” philanthropy include local community service grants, need-based college scholarships for Staples High School seniors, food closet (in partnership with Westport Human Services), annual Canal Park luncheon, subsidized rent for CT Braille, Bedford Hall usage grants for nonprofits, and many hours of volunteer service. Please visit the WWC Community Services Page to learn more. 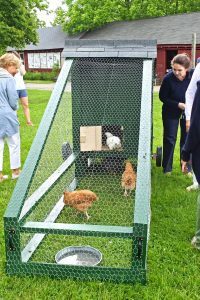 Mobile Chicken Coop that aids in soil fertilization. 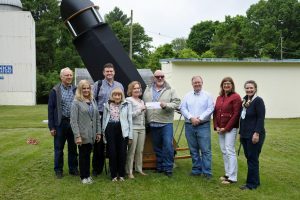 2017 Ruegg Grant to members of the Westport Astronomical Society Board. viewing with astronomy enthusiasts in the Westport community.